No, those colours aren’t processed to make them look more vibrant – if anything, the photo doesn’t quite do it justice. This is another variety I picked up on a whim, not knowing anything about it. I acquired these seeds originally in 2009 from a home gardener in Nelson, BC at the annual Seedy Saturday. Unfortunately, at the time I didn’t think to probe further about where she had gotten the seed, or indeed, any contact information so I could go back and speak with her later, so the origins of this tomato are a bit of a mystery. Six years later, and I still haven’t been able to find more information, and despite reaching out to some other tomato growers with encyclopedic knowledge of varieties, not one person has been able to attribute this variety to another name. I’m assuming at this point it was a variety the grower I received the seeds from crossed in her own garden and isn’t widely available outside of the Kootenays, so I’m glad now I grabbed them up when I did. This one is a large plant, but grows relatively erect, making staking a good option for the garden. It easily grew over 5 feet in my garden, and with a slightly longer season I can see it growing up to 6 without much effort. This variety has heavy leaf coverage, and without the benefit of those hot pink stripes, picking the green fruit would be a game of hide-and-seek. Fortunately that leaf coverage also protects the fruit, so even in hot, hot weather this variety really takes off, and in fact, seems to grow better the hotter it gets. Here on the prairies this is coming up on a later season variety, but much like ‘Sibirskiy Velikan Rozovyi’, in a longer season this one will give imaginably a large harvest to the grower. Even in my shorter climate, I harvested about 12lbs per plant, with the fruit averaging about 10oz (290gr) each. I did grow this variety one year on the coast, and the production definitely wasn’t as good, making this one a better grower if you’re in a dryer, hotter climate. The colours on this variety are amazing – that hot pink, offset by the deep forest green is quite something to see on the vine. This variety has a definite wow factor in the garden, eliciting quite a few “ooohs” and “aaaaahs” when visitors came by. 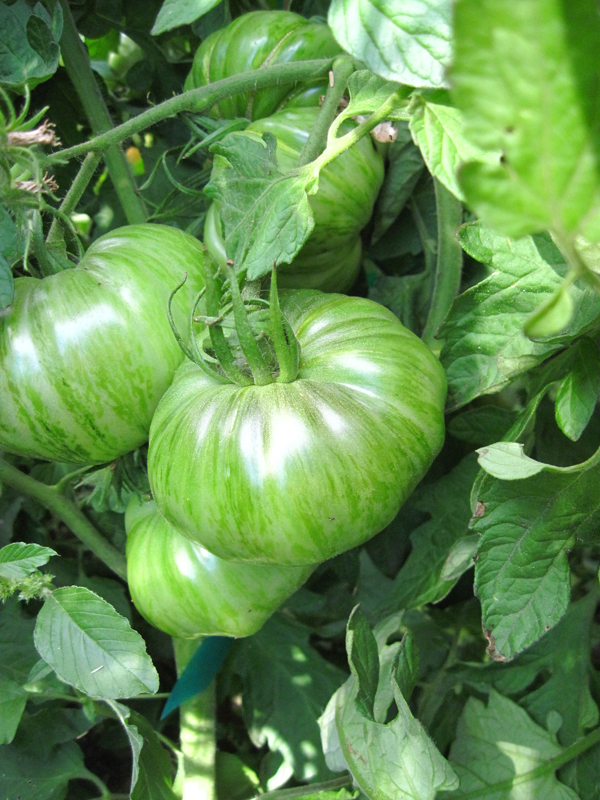 Unlike other green-when-ripe tomatoes, this one doesn’t ripen to a chartreuse/greenish-yellow, it stays deep green. The colours on this variety give the grower a hint of what it’ll taste like. Like pink-fruited varieties, this one has a bit of sweetness, but like green fruited varieties it’s definitely got a kick of acidity. It’s delicious eaten fresh, and when stewed down and frozen keeps quite well. 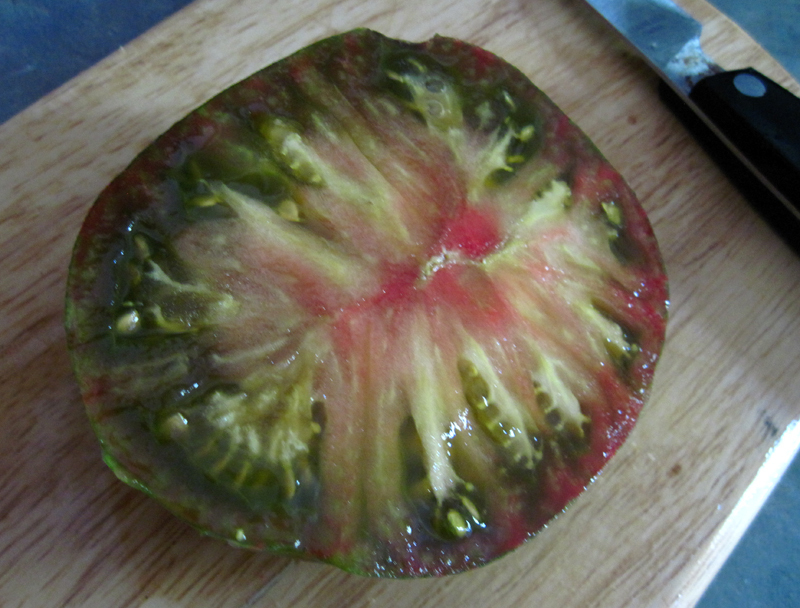 This one also ripens quite well off the vine, and keeps the flavour when picked green and ripened in doors. While I wish I could make this one ripen a little bit faster, making it really optimal for a season longer than our ones in Central Alberta, it’s still a winner to grow here due to it’s easy ripening-off-the-vine and love of hot summers. If you live in a wet climate, I fear this one isn’t for you, because it does suffer quite a bit when too wet. 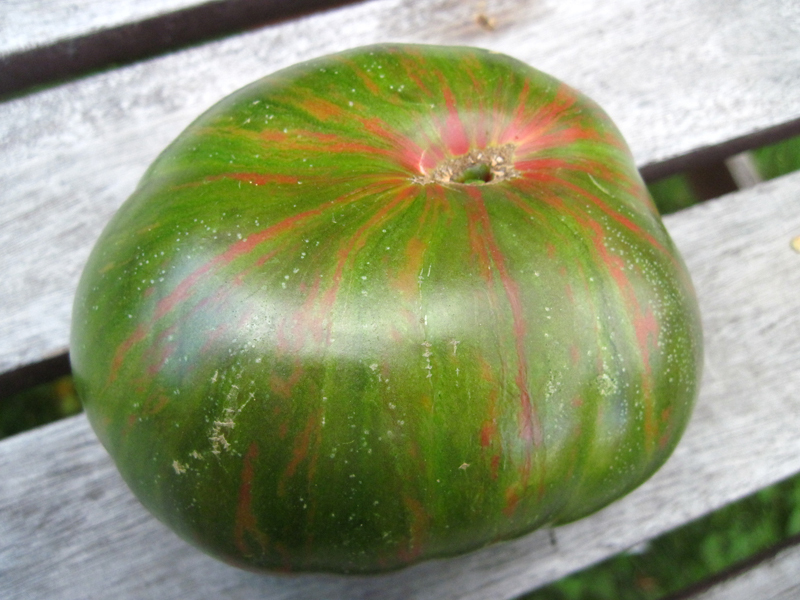 It’s plain to see why this one is so well adapted for the Kootenays, and it’s excellent flavour, and jewel-toned skin, it’s a stunning tomato to present on the table for guests. You can see the detailed wiki entry for this variety here. There are still seeds for these currently available for distribution! If you’d like to request some, visit this page.